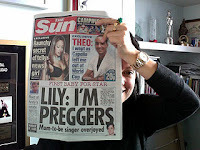 I read today that Lily Allen suffered a miscarriage over the weekend. She was six months pregnant with a boy and due in January 2011. People.com wrote a nice piece. This was her second miscarriage. My heart goes out to her, particularly because she's in the public eye and this opens her up to even more scrutiny. I hope people will be compassionate during this very difficult time. This just shows that no one is safe from the pain of losing a baby. My heart goes out to her and her partner.